Fofo-babble | Deep think, biking, sci guy stuff. We got a new cargo bike and it’s a doozie. 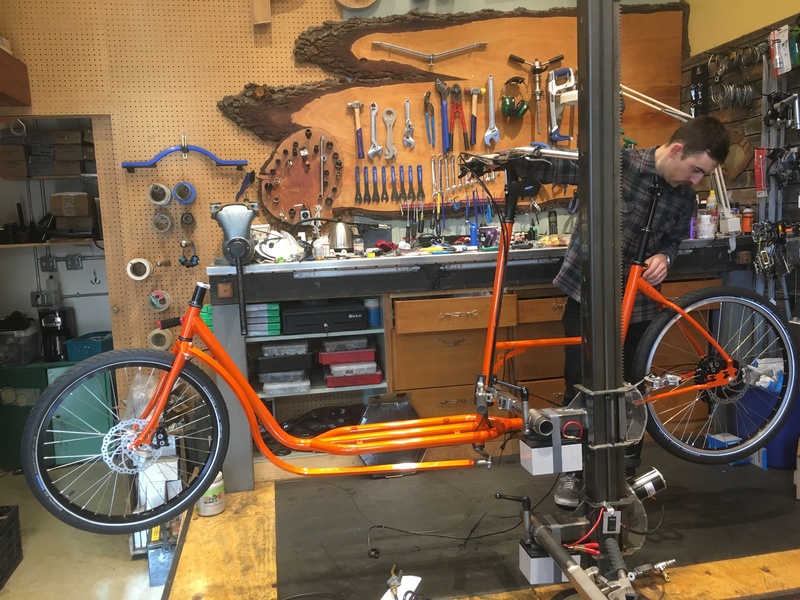 Meet the very last Metrofiets box bike: Tangerine! Metrofiets made front-loading box bikes in Portland, Oregon for 12 years, and they’re fantastic bikes. These bakfiets-style cargo bikes have a solid front box, a long-wheelbase, and a 24” front tire for a cushy ride. 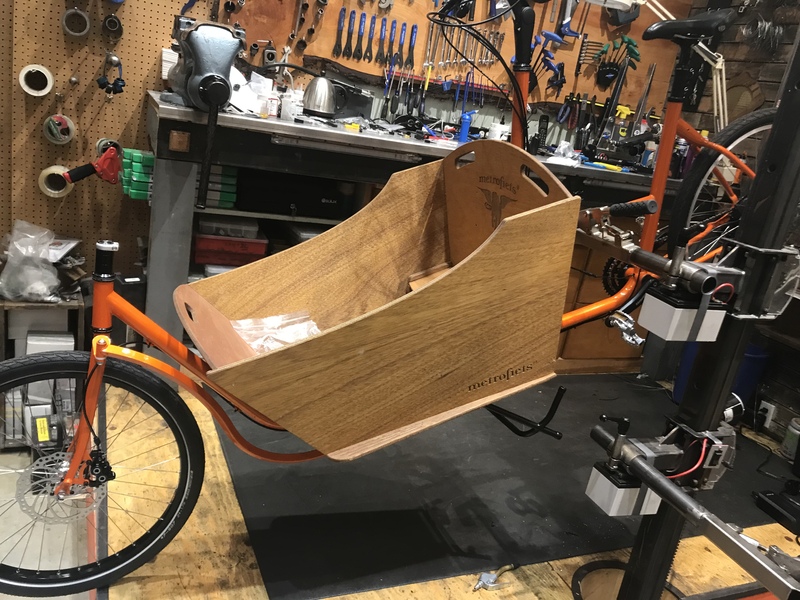 When Metrofiets went out of business, we got our hands on the last frame and set to build up a custom electric cargo bike. 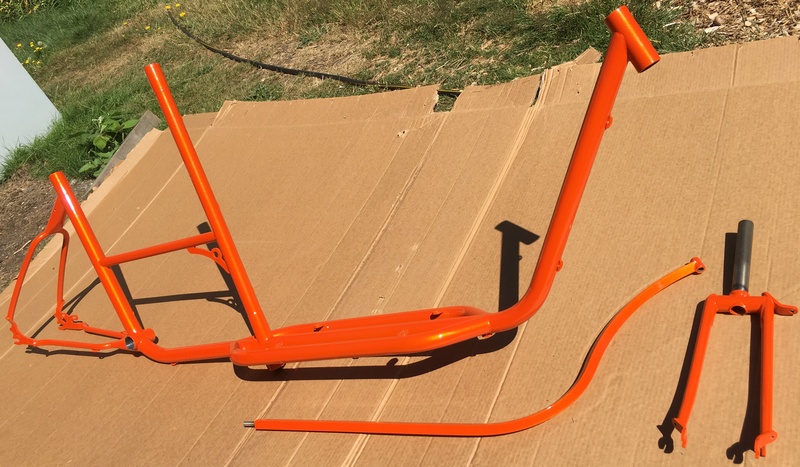 Step one was powder-coating, the long-lasting way to “paint” a bike frame. As we got to do this ourselves, we chose a custom sparkly tangerine color from Seattle Powder Coat. Before adding the box, you can really see the “Long John” style. This thing is 9 feet long! Tangerine on the stand at Electric Lady. Electric Lady in Seattle built up the bike, with an electric hub motor from Bike Swift. 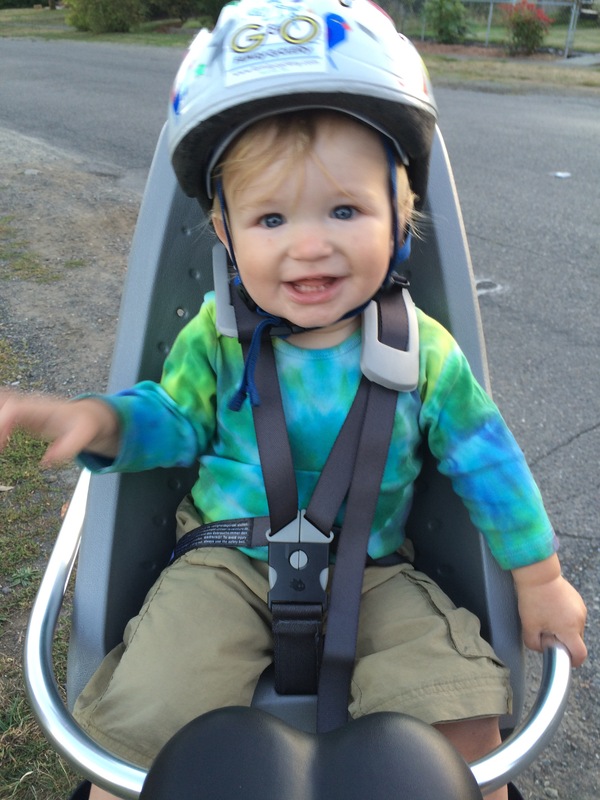 We haven’t had an electric bike, and the kid is just getting heavier. With both of us riding bicycles regularly, we opted for “only” a 500-watt motor, but it’s a Bafang hub with some serious torque. Henry from Bike Swift says it’ll do “up to 80 N-m”… which I honestly don’t understand, but must be good! It has a bunch of little details, I’ll give a full rundown after the ride home! Perhaps you’ve seen this breakdown of actions and choices that can be made to help us adapt to climate change, and for our children to survive global warming. It’s pretty great because it quantifies how effective our choices really are. The part about choosing to have fewer children has been rightly critiqued, as not everyone has choice or control over having kids. Besides, a bunch of us already have the critters. Regardless, in the context of climate action, children are an opportunity. A big problem with taking action is change. People like driving everywhere in their giant gas-guzzling cars with their stuff, burning carbon-rich fuel to move and air condition and blast tunes. We hate anything that gets in the way, such as buses or bike lanes, or pesky pedestrians. Why would we want to be them when we could be comfortable in our cars? Besides, we need comfort to distract from being stuck. Our growing commutes and drives around town mean we’re often trapped in our metal boxes. It’s gotten to the point where we feel we must drive our children everywhere, despite the inherent danger in driving itself. It’s just that we’re warming and dangerously destabilizing our planet. We’ve gotten too comfortable to change. Still, children are an opportunity for change. They like riding bikes and taking the bus. It’s all one big adventure. But driving is so comfortable and convenient, why would we stop? Of course, cars are dangerous on their own. Cars are actually more dangerous for children than guns. The opportunity is that we can choose. We can choose to transport our children more safely, and choose a safer path for our planet by doing so. The kids won’t know the difference. This will just become their new normal. When I was a kid, my parents let me watch the Space Shuttle launches. They were often delayed, so I remember waiting in the morning, watching the countdown and liftoff, then running off late to 2nd grade. Then in 1986, the Challenger disaster happened during the launch, and in 2003 the Columbia broke apart on re-entry. The shuttle program was shut down, and I pushed that youthful excitement aside to live a life wondering about global warming, instead of how to terraform a habitable Mars. This morning, I heard on the internet that SpaceX was launching their heavy booster rocket. Somehow I’d missed that they were launching a Tesla towards Mars. (Wait, a Tesla? Yep. We’ll come back to this.) Ten minutes later, I’d tuned in to the live webcast of the Falcon Heavy launch, and was excitedly showing my son Orion (yes, that’s his name) as we watched the countdown. It was exhilarating! I was pointing out parts of the process, when suddenly the Tesla was floating in space. It’s more than a little disconcerting to realize your childhood hopes and dreams have been hijacked to deliver a car commercial. (At least it’s an electric car? But electric cars are still a huge part of the problem!) At any rate, I’m not sure I want the future where we go to Mars for the benjamins. Meanwhile, two of the falcon rockets made their way back for a simultaneous landing. This was stunning to see, but what about that third core? Watching the live feed, you can tell something’s gone wrong. The bubbly hosts are off script and grasping at straws, and you can see (or rather not see, SpaceX has sensors and two cameras on everything, so they definitely have telemetry and footage). The PR aspect of this whole thing kicks in. If SpaceX had a successful landing, they’d show it. Not showing us feels like damage control. The sucky thing about outsourcing our space program to private corporations is that they control the signal. Family Bike, part 2: NEW BIKE! But I’m finally getting a bike meant for these things. All of them. At once. I have a one-year-old, a ten-year-old, a partner that rides, a commute, and everyone has a powerful need to eat – so it needs to hold groceries, too. 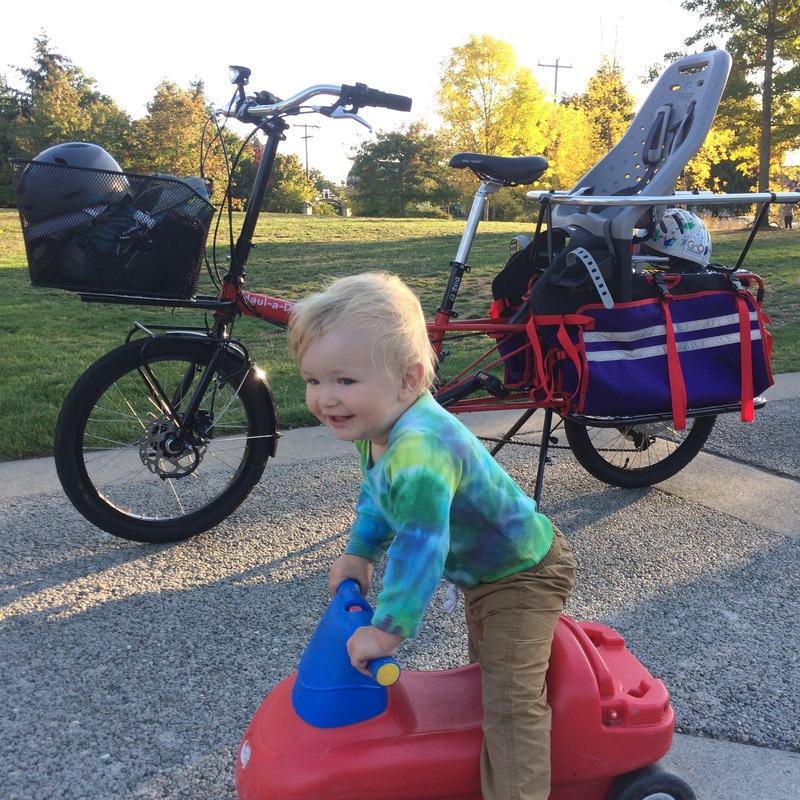 Okay, it’s not the ultimate family & cargo bike… such as a bucket bike you can just throw anything in, or the full-size EdgeRunner with a bit more room to grow, but this is perfect for me. For what I need, and for my budget. I’m getting a Bike Friday Haul-a-Day. Red. 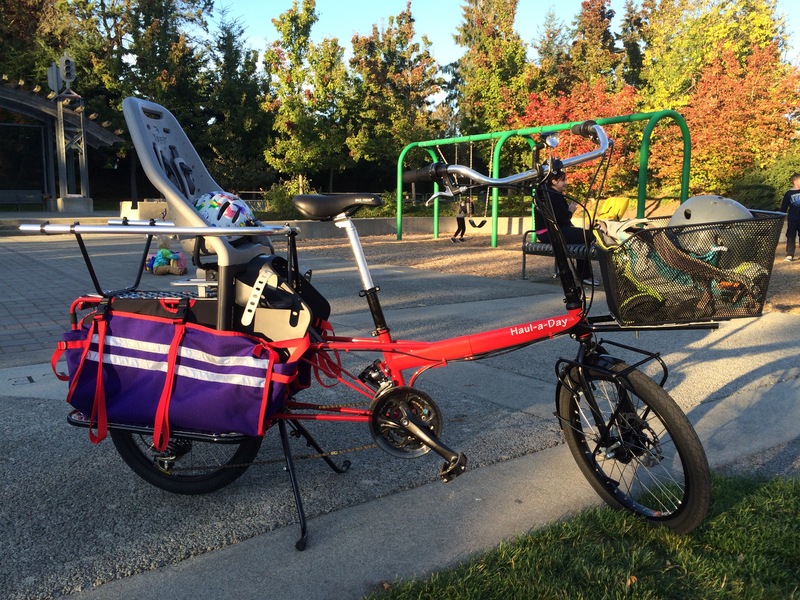 Basically, it’s a small-wheeled, long-wheelbase cargo bike, set up to carry a kid and anything else we might need. It has 20″ wheels, and an ingenious telescoping frame, which will allow both Aimee and I to ride it, and allows it to fit on a bus rack. They’re locally made in Eugene, OR and are fantastic little bikes. Already went to the park! And I’m getting a few more things to make life easier: Lots of storage & carrying options (a nice front basket & front pannier holders, really great bags). Dynamo lights that don’t need charging, (and a usb outlet to charge my phone – ABC: Always Be Charging). This is Seattle, so fenders. Of course, fenders. I’m getting about $3000+ worth of bike, here. To do this, I’m applying for financing, which actually makes it easier to spend a bit more on what I really want. I’ve never bought a car, but this is actually wayyy better. I’ll pay it off in a year, be improving my credit, and I won’t be stuck with a dang car in the end! But I’m also stopping short of the electric-assist route. I’m pretty sure I’ll want that later, after the kid eats for a few more years and I get that much lazier. For now: gears. Lots of gears. 24 should suffice. I’ve been riding a 7-speed folding bike, so that should be plenty. Well, time to get in gear for toddler preschool and some car-free Costco runs. See you out there! When my son Jack was born, I was driving an SUV (I know!) & I went through a few cars. A story for another time… Anyway, I biked around a lot. So I thought, what if I just keep doing that, but take the kid with me? It seems a bit crazy now, but in 2007, when I started seriously looking, none of the modern options for a family bike existed. I hadn’t even heard the term “family bike”. There were Longtail Xtracycle conversions, but I didn’t know how to do that. The Kona Ute and Surly Big Dummy didn’t even come out until 2008. 20/20 Cycle had a great Bilenky Cargo Bike, but I’d still have to figure out how to get the kid on the front… and all of those options were out of my price range. “Can’t do it”, they said. “I think that’s illegal”, they said. The other thing I wanted to do was ride around with an electric assist. (Kids just keep getting heavier!) When I had some money saved up, I went down to the local Electric Bike store, and told them just that. Basically: “I want to haul a kid around on an electric bike”… “Can’t do it”, they said. “What if I just pull a trailer with the e-bike?”… “I think that’s illegal”, they said. I literally had a few thousand dollars to spend, and no one wanted to take it. Around this time, I started honing my now-superior Craigslist skills. I started looking up electric bikes which I could afford, and researching them. Omg, here’s my actual color in potato quality. Eugh! I went to Bauhaus (RIP) to meet this guy from Iowa, who was motivated to sell. (Having received tenure, he was moving back). He’d moved out here from flat flat Iowa, and got an e-bike for Seattle’s hills, then just didn’t end up using it. Speaking of flat, it had one. We took it to a dealership around the corner, pumped it up, and I went for a spin around the block. It’s pretty hilly there, and that thing would really go. I came back around with a huuuge grin. “You can go for a longer test–” he started to say. “No, I’ll take it!” And I handed him cash.